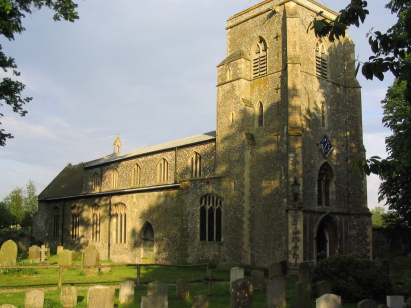 The parish of Holt lies in North-eastern Norfolk, a substantial village Holt lies a few miles inland of the North Norfolk coast astride the A148 road which links the seaside resort of Cromer to Fakenham & King's Lynn. Holt has always been an important village for this area as can be seen by the size of this transcript. Nowadays it is an affluent place with all its shops, pubs and conveniences - a popular retirement destination it is also characterised by antique shops and fine restaurants. Holt in the past would have been a meeting place, market and shopping centre for the surrounding farming villages and its population would have placed it firmly in the large village status. St Andrew's church is tucked away at the eastern end of the High Street, in almost exact symmetry to its principal competitor, the Methodist Chapel, at the western end. 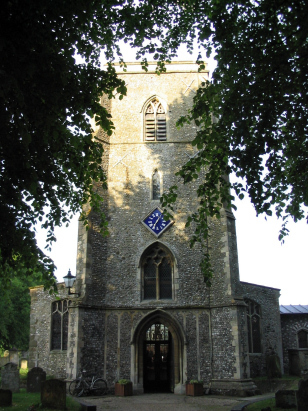 The church is situated in a wide churchyard accessed by a tree-lined driveway or by numerous footpaths and alleyways cutting through houses and shops. The church is large but Pevsner states it is of little interest due to over zealous restoration in the Victorian era. Traces remain of Perpendicular style and a date in the 14th century seems most probable. Two standard 1600-entry register books cover the period of the transcript, the second continuing onward to finish in 1902. Both are filmed on Microfiche, the first volume having been recently re-filmed on Microfilm MFRO299, the second on Microfiche 12 & 13 all in the collection of the Norfolk Record Office. The first volume is clearly in a poorer state of preservation than the second - its images are fainter and less crisp despite the recent re-filming which replaced fiche which were inadequate. Despite the poor images for the first book the results are readable with care and as a result this was a straightforward transcript to prepare - although clearly in a lengthy transcript there will always be some problem entries. Hopefully these have resulted in few errors.